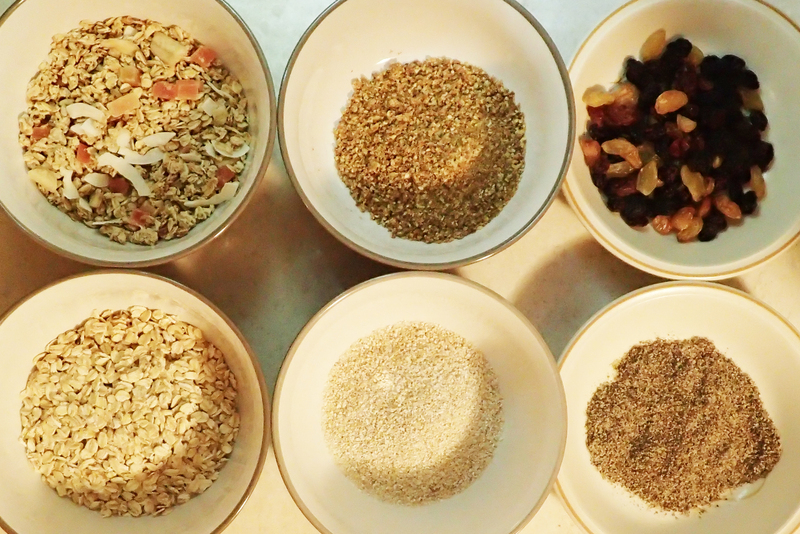 These days everyone from mainstream manufacturers, through cottage industries to hikers themselves are knocking together their own personalised mix of grains, seeds, pulses and whatever. Not to be outdone, I have been experimenting with my own mix. Samuel Johnson may have been having a pop at the Scots when he delivered his definition on the humble oat but those Scots know a thing or two, and I agree with them. Three Points of the Compass has been a long time believer in the great powers of the oat. My fondness for both black pudding and haggis not only probably owe much to their oat content, but sadly, does not warrant further comment here. While I have struggled to make oatcakes palatable (that battle remains to be won), porridge or oat based granolas have been staple breakfasts for many years. However I frequently wish to simply get going and not faff around with pans etc. followed by subsequent cleaning and packing up. 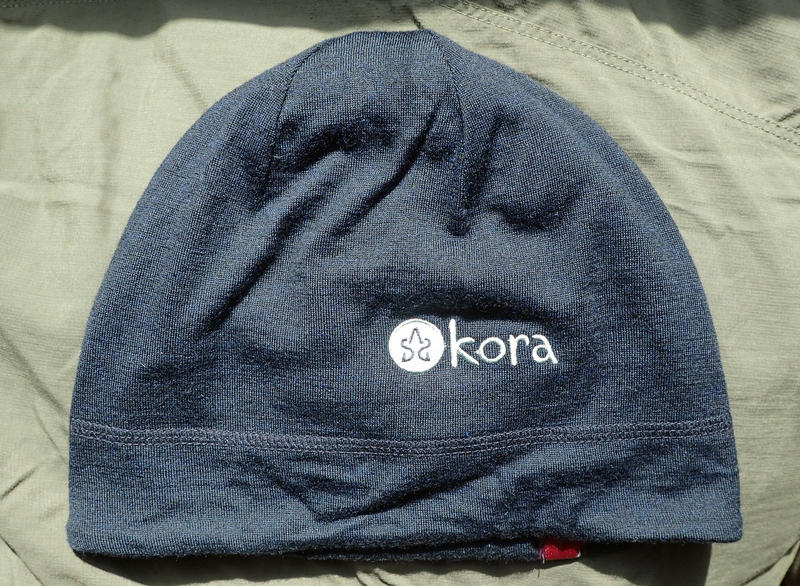 While day hikes, especially in the winter months, mean much shorter days and breakfast on the go can be the norm. Various oat based granola bars are good, some of them are very good (and some truly awful), but are often insufficient in themselves. Hence my efforts to improve on this and build a breakfast that is both palatable, pretty healthy and provides sufficient energy and can also be consumed over a longer period rather than simply as a one-sitting breakfast. My body (and yours) can only process about 400 calories an hour so it is important for me to snack throughout my day’s activity rather than as I might at home, in two or three sittings. So I decided to have a go at mixing a few additional ingredients, that all prove beneficial for one reason or another, in with my simple oats. It turned out rather good. As the ingredients would indicate, there is a high fibre content to this mix. Much of it from the mix of oat included. The benefits of oats are well known. Their high fibre content (specifically beta-glucan) mean that they help remove cholesterol from the digestive system, they also enhance immune response. Because they have a very low glycaemic index (G.I. ), they are slowly absorbed into the body’s blood stream meaning a slow release of complex carbohydrates (energy) which helps stabilise blood sugar levels. Oats are a pretty amazing food stuff- containing vitamins B1, B5, B6 and E, zinc, iron, soluble and insoluble fibre, carbohydrate, riboflavin, calcium, magnesium, folic acid and potassium. Oats have the highest protein content of any cereal. 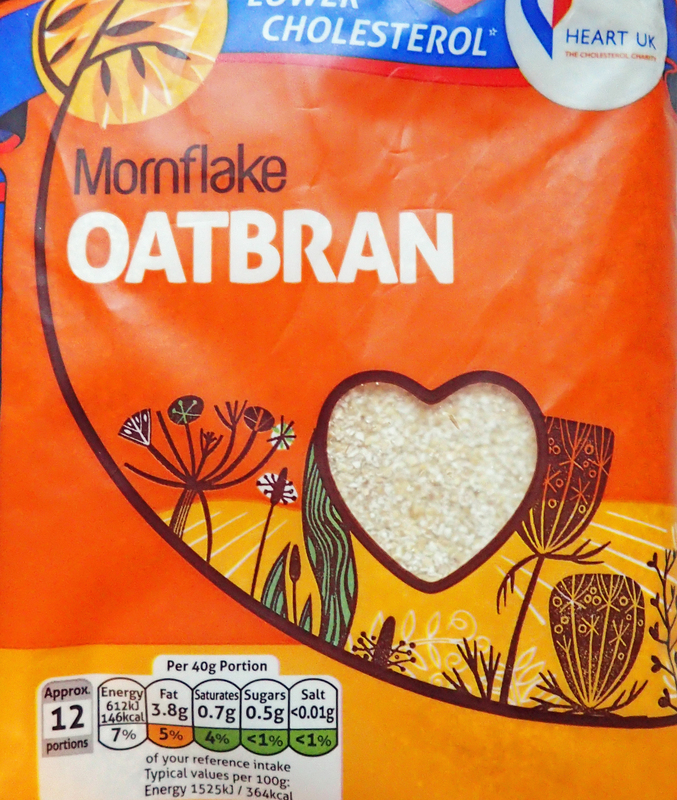 Oatbran contains 13.4g of protein per 100g. There are some individuals whose bodies cannot handle oats for one reason or another, fortunately I am not one of them. 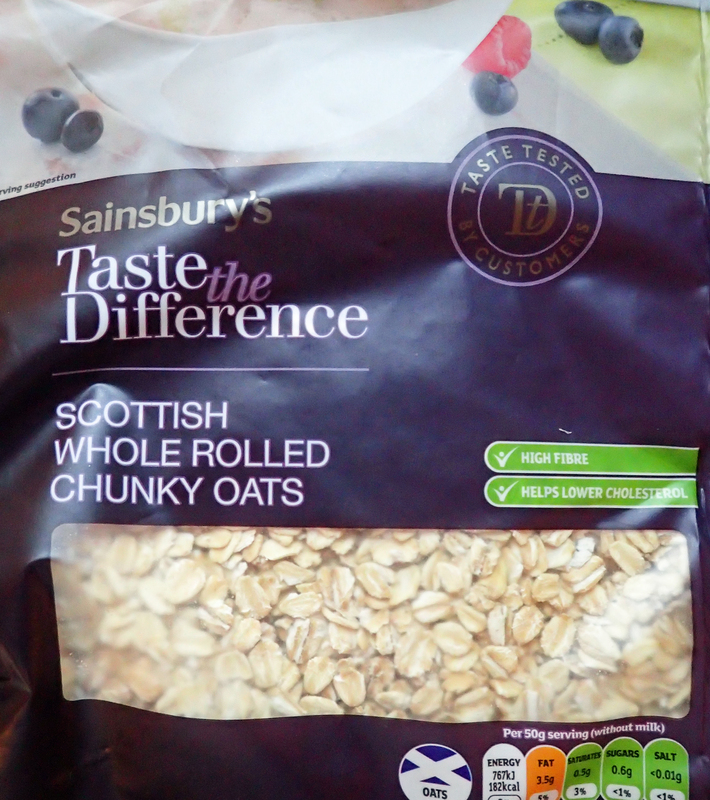 Rolled oats (oatmeal) are the whole oats, the flat flakes being produced by rollers. 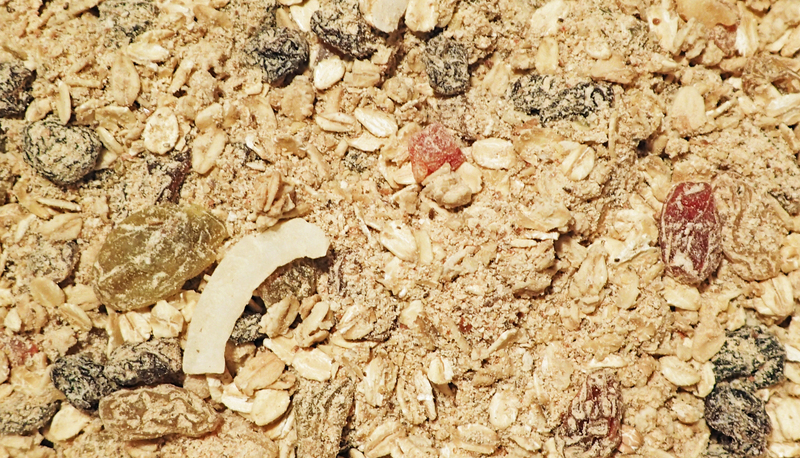 While oat bran (providing selenium) is only part of the grain. 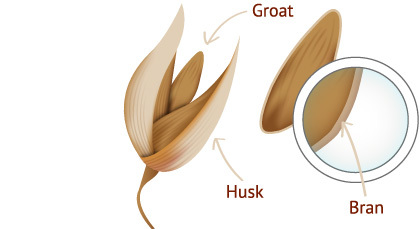 As mentioned, in common with whole oats, oatbran, with 18.2g of fibre per 100g, is also a good source of beta-glucan soluble fibre which lowers blood cholesterol, absorbing excess cholesterol and taking it with it as it works its way through the body. 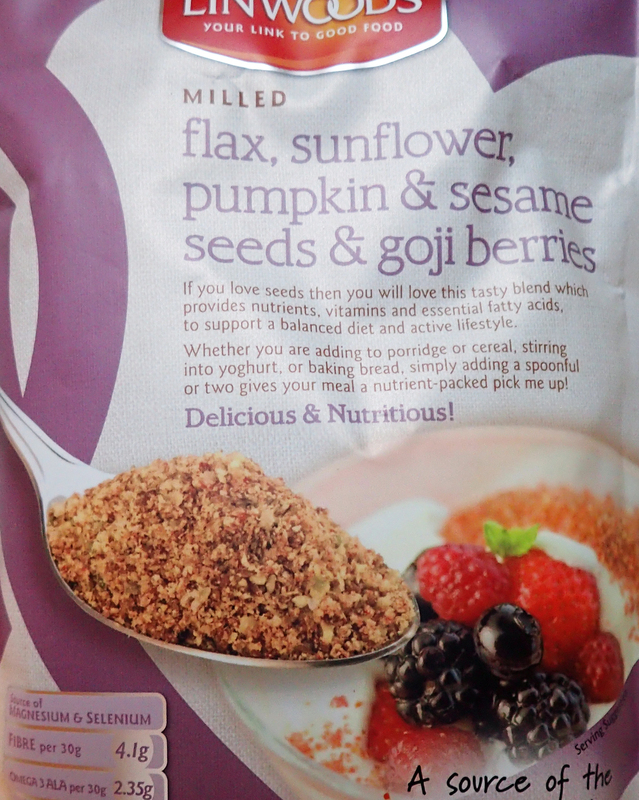 A mix of milled seed and berries produced by Linwoods simplifies my separate sourcing of some desired ingredients- Added flaxseed provides Omega-3 fatty acids, not delivered by the oats. I am not going to go into every benefit offered by some of these ingredients as such things are easily researched online. However it is worth noting that, by providing manganese, both oats and flaxseed aid the body in metabolising nutrients which supports energy production. And if there is one thing a hiker needs, it is energy production! Sunflower seeds are rated one of the World’s healthiest foods. Having a very high oil content, they are a main source of polyunsaturated oil. They are an excellent source of vitamins E and B1 and copper, and a good source of manganese, selenium, phosphorus, magnesium, vitamins B6 and B3 and folate. Both sunflower and pumpkin seeds are very high in phytosterols, believed to reduce blood levels of cholesterol and enhance immune response. You may be unaware that vitamin E comes in various forms (as I was). Pumpkin seeds, with their antioxident benefits, are exciting considerable interest amongst nutritionists as it has been found that not only do they contain vitamin E, as do many other foods, but they also deliver it in a wide diversity of forms. Pumpkin seeds are a very good source of manganese, phosphorous, copper and magnesium and a good source of zinc, protein and iron. The jury is still out on the perceived benefits of goji or wolfberries. There are those that proclaim great things from these. I will take a chance and accept there is likely to be something in what is claimed. Certainly they have formed part of Chinese medicine for many hundreds of years. I shall not go down that route, you can always look up such things yourself and form your own decision, suffice to say, they are the most nutritionally and protein dense fruit known. They contain all essential amino acids and twenty-one trace minerals and are high in fibre, as well as iron, calcium, zinc and selenium. Cited as possibly being the oldest condiment used by man, sesame seeds have the ability to lower cholesterol and help prevent high blood pressure. Of interest to those suffering from rheumatoid arthritis, in common with sunflower seeds, sesame is an excellent source of copper (proven to reduce pain and some swelling in sufferers) and a very good source of manganese. They are a good source of calcium, magnesium, iron, phosphorus, vitamin B1, zinc, molybdenum, selenium, and dietary fibre. It appears that scientists have yet to agree where selenium lies in relation to cancer, it is possible that a deficiency can increase the risk but it is not yet determined. It is clear that selenium is a requirement for antioxident protection and other benefits. Of global concern is the increasing instances of sesame seed allergy. It has also been found that many people with a nut allergy will find themselves intolerant of sesame. chia seeds are an excellent source of antioxidents and omega-3 and are also a very good source of dietary fibre and manganese and a good source of calcium and phosphorus. The seeds can absorb up twenty-seven times their weight in water so it is important to mix them with other food and ensure water is consumed as well. High in both fibre and protein, chia has 22.9g and 21g per 100g, respectively. Most people are familiar with the breakfast cereal Granola, usually consisting of rolled oats, nuts and honey, often baked until crisp. Dried fruits and chocolate may be added. As a named product, Granola was a name trademarked by John Harvey Kellogg in the late 19th century for a food consisting of whole grain crumbled and baked until crisp, Kellogg had changed the name from his earlier Granula but again changed the name to avoid infringing on an earlier breakfast patent, (note-another cereal, Muesli, is neither baked nor sweetened). Kellogg’s later change was to the familiar ‘Corn Flakes’. To give me a little variety in taste, I have added a decent portion of a branded granola. This is Jordans Tropical Fruits Oat granola. While this contains 65% toasted wholegrain British Oats, it also delivers 15% fruit- dried papaya, coconut chips, dried pineapple chunks and dried banana chips. There is also a touch of sugar, honey, almonds and other stuff present. At some point I shall knock up another bunch of my breakfast superfood, swapping out the Tropical Fruits granola for Jordans Fruit and Nut granola or perhaps simply add dried banana chips, mango and nuts. There is a lot of fibre here, all good stuff, we know that. Such a meal does require a decent amount of liquid intake as well to not only let it do its job, but also to prevent bloating. 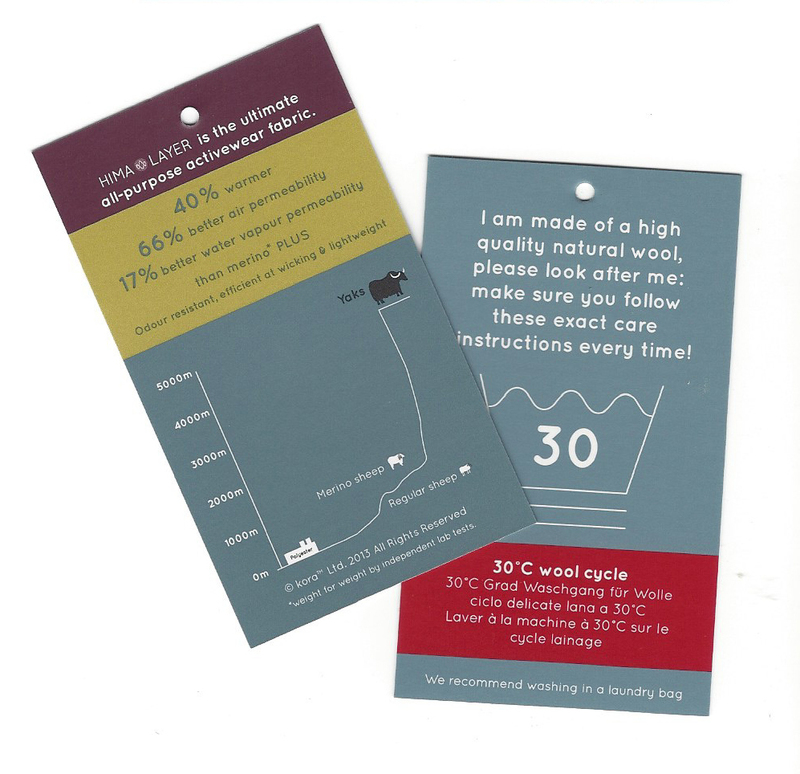 Once soaked for eating, that is insufficient in itself and good additional quantities of water are advisable. The addition of Jumbo Raisins adds a little sweetness to the mix and makes it all a good deal more palatable. Being left to soak overnight means that the raisins are additionally juicy. 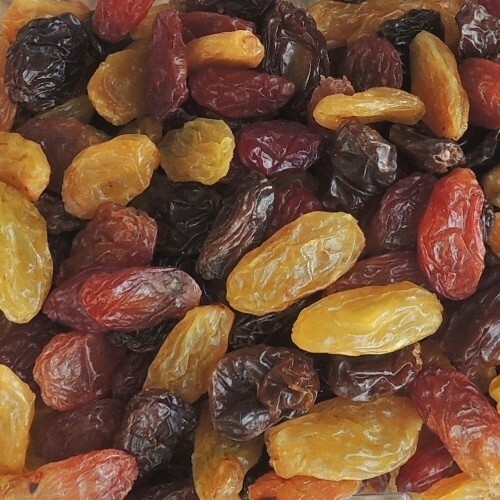 Low in salt and saturates with no saturated fat or cholesterol, raisins are 23% sugars. 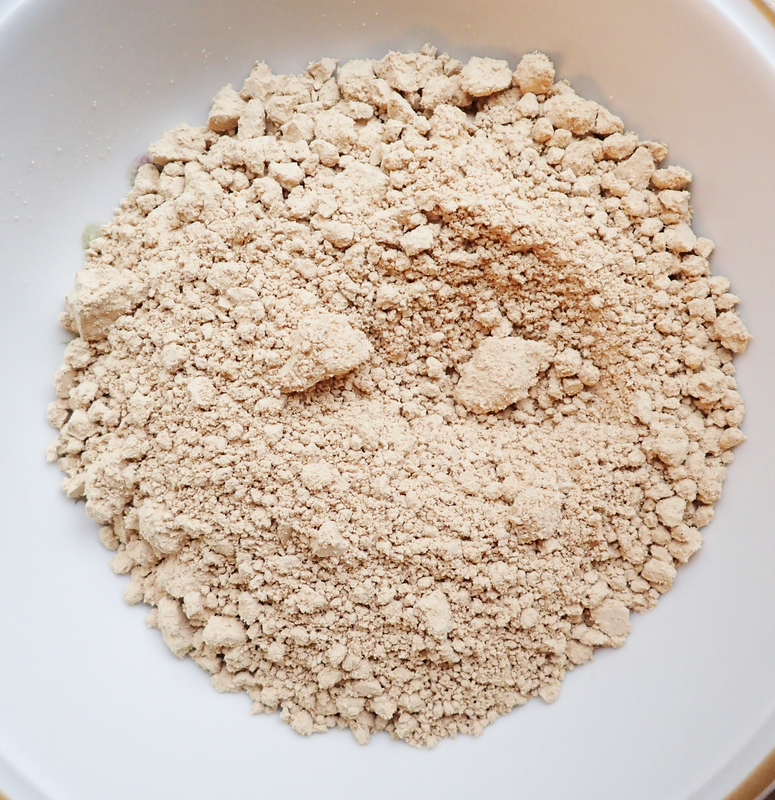 The addition of Peanut flour is an effective way of adding protein to the mix. Many hikers will be aware that protein contributes to the growth and maintenance of muscle mass and the maintenance of normal bones. I have long been a fan of peanuts and I feel for those who suffer an intolerance. Not only do peanuts taste great, (easily my favourite snack), but they are also rich in the minerals magnesium, iron, copper, potassium, zinc, calcium and selenium. Instead of adding whole or crushed peanuts to my morning mix, I went the flour route. In addition to such minerals, peanuts are high in nutrients, antioxidants and vitamins. 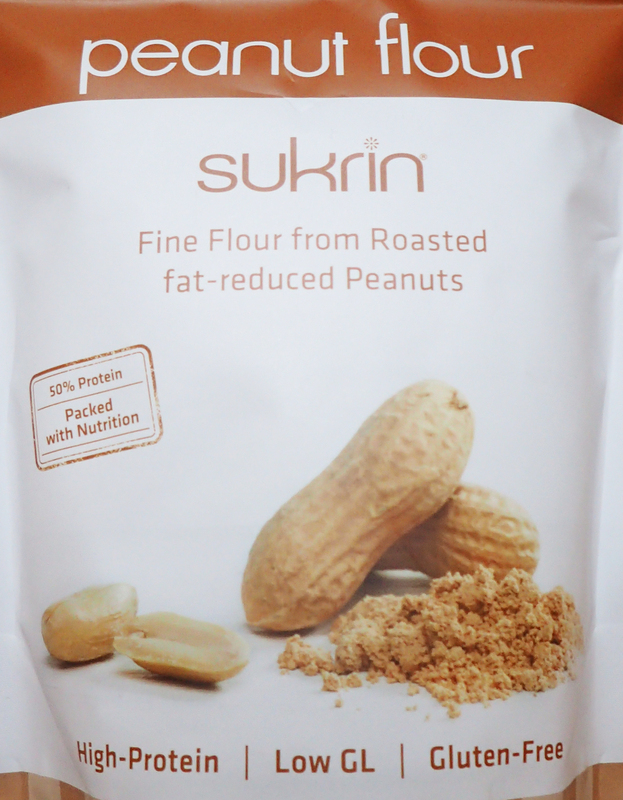 I only recently came across peanut flour- Sukrin’s peanut flour is made from finely ground US grown peanuts, the flour is 50% protein and 11% fibre. Low in carbohydrates, it also has a low Glycemic index and low Glycemic load. Interestingly, a low fat, smooth peanut butter can be made by adding a little salt, sweetener and water to the flour. This may be a product I have to look at further for its potential as a dry-pack food to cart along with me on longer hikes. I have yet to try some of the other Sukrin flours available- almond, coconut and sesame. 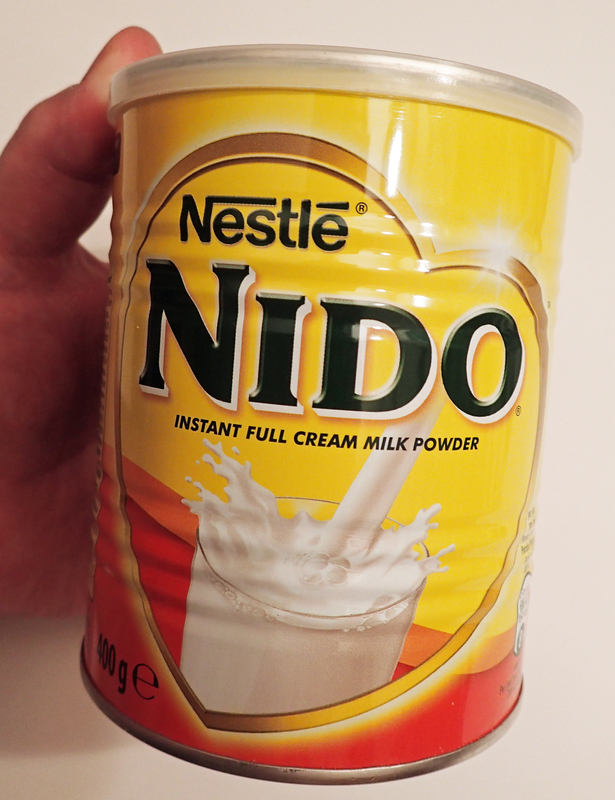 400g tin of Nido full fat [cream] milk powder. Larger tins and other (fortified) varieties of Nido are available but I am yet to come across them. I have used Nido milk powder for many years for knocking together porridge. Used in this way it makes a lovely creamy offering. This full fat milk powder, (note- not the fortified variety), is as far removed from the low fat alternatives as you can get. About 130g of the powder mixed with 900ml of water will make around a litre of milk so I added 100g to my mix which seems to be a decent amount. 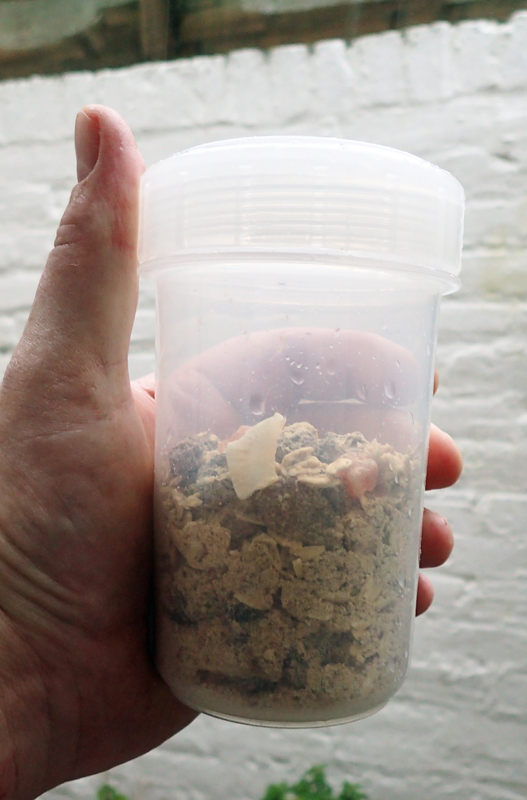 When mixed with the other ingredients as I have, running throughout the complete dry mix, there is no clumping or lumpiness as a result. It really is quite a palatable product. While expensive, this full fat milk powder will keep for some months if kept sealed, in the dark, or in the fridge if possible. This is because of the high fat content, meaning that it can go rancid once opened. The final mix, absolutely lovely! I work out the contents of this, slightly less than half full, container to be around 289k/cal per 100g. So, what is it like? Once properly soaked through, it is a creamy consistency with a taste that I really enjoy. In short, it is bloody lovely. The change in texture and sweetness of the occasional fruit makes a considerable difference to its palatability. 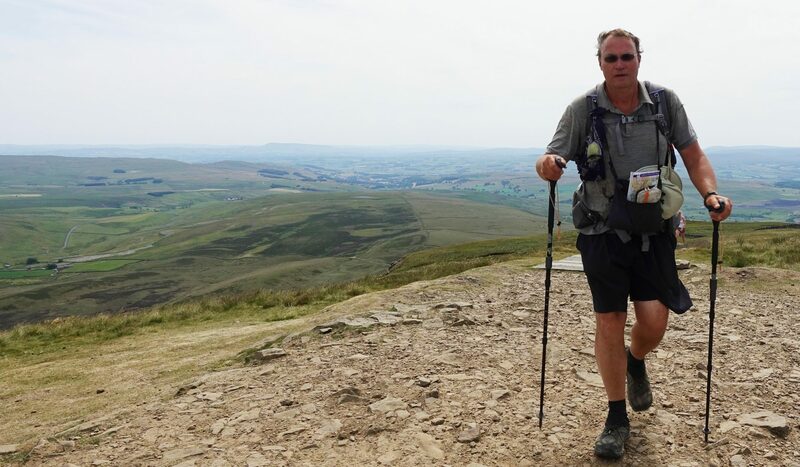 I have found that an effective way of taking my ‘power food’ on a day hike is to put around 130g into a 0.4lt (400ml) hard plastic beaker with a screw on lid (70g: beaker and lid). This portion size would equate to around 376k/cal. So not fantastically high in calorific value but this is a fairly modest sized portion and it does have a good balance of the nutritional essentials. If this is topped up with cold water the night before, everything is nicely soaked and the fruits etc. 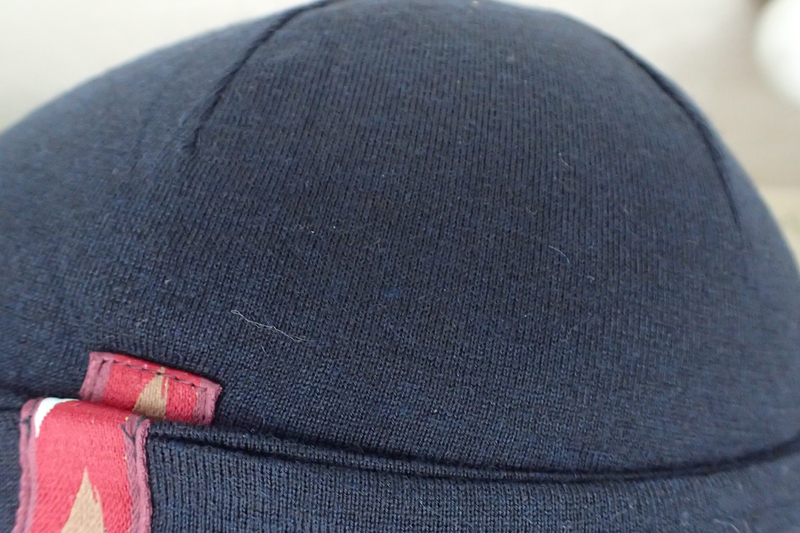 are beautifully plumped up and soft. Keeping this in a side pocket of the pack, I can fish it out at will. Then the lid can be simply unscrewed and a mouthful or two (or the whole lot) can be spooned out with a long-handled spoon. If I want to, another [dry] helping can be poured into the beaker and topped up with water again and left for, preferably, in excess of 30 minutes before dipping into. 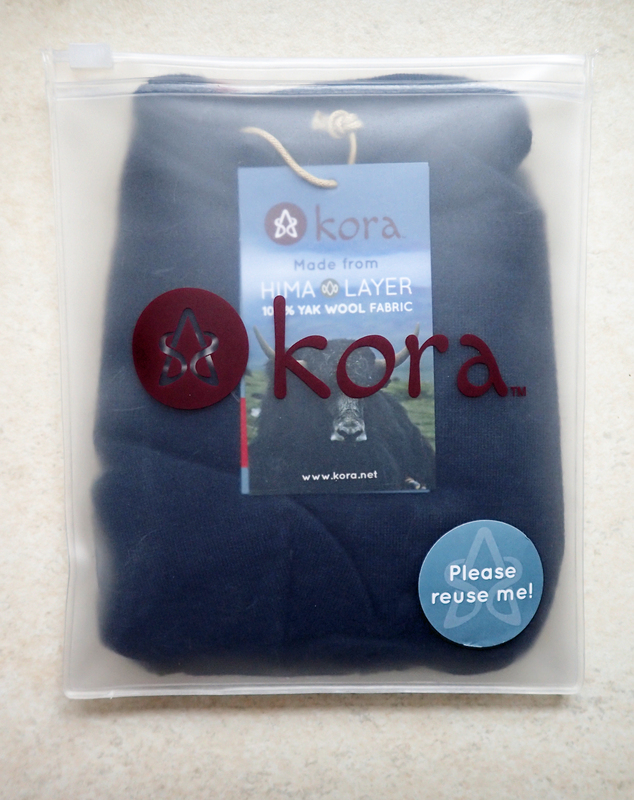 Obviously I could alternatively bag it up in zip locks for multi-day hikes. Note that there is very little salt in this mix, just about the only sodium present is that which naturally occurs. This entry was posted in Food, Uncategorized and tagged Food on January 4, 2016 by Jools.